Homeopaths Without Borders sponsored this mission to help tsunami survivors. 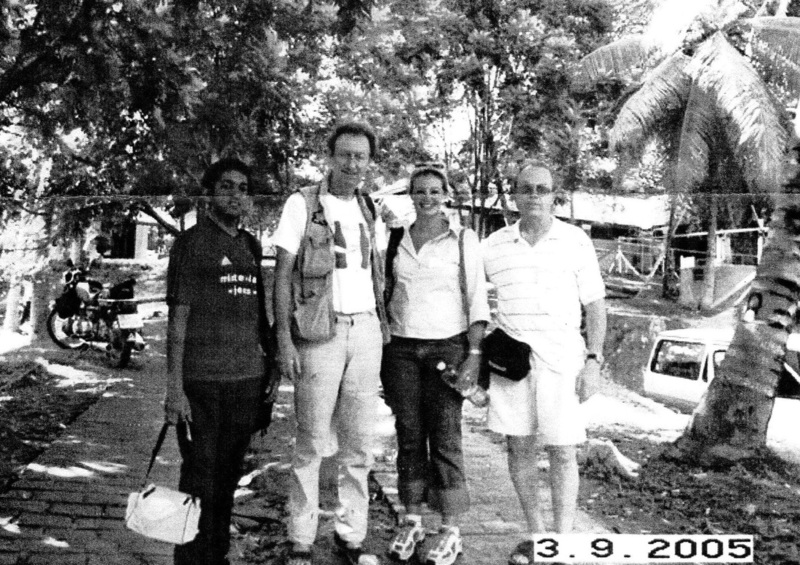 Pictured below are Sumudu Fernando (translator), Dr. Luc De Schepper, Dr. Ivy Dieltiens, Dr. George Strom at the orphanage site in Galle, South Sri Lanka. We, 2 doctors from United States, Dr.Luc De Schepper, MD, from Santa Fe, NM and me, Dr.George Strom, NMD from Boston, MA arrived at Bandaranaike airport near Colombo Sri Lanka on March 5, 2005 at 5 am of local time, which corresponds to 6 pm of the ET(Massachusetts ). In Colombo alp was a first surprise: my luggage was lost, or simply not arrived with me. I filed report, with hope, that it will be found later. There was all my summer cloth, personal hygiene stuff and, and the most important, my new digital camera Minolta Dimage with charger. Also, some medical equipment, like, Stethoscope and the Blood pressure Kit. I do not remember what else, but what I listed was bad enough. Imagine, I came from Boston, with 2 feet of snow and 30F to 95F and high humidity in my corduroy pants, and flannel shirt? We took a taxi to Joe De Livera residence, the local businessman , and now friend of ours, who is passionately involved in organizing and promoting Homeopathy here in Sri Lanka. He generously allowed us to spend the rest of the day at his house. His wife and her 2 sisters were our first patients . They have been suffering from arthritis and sciatica. Dr.Luc took their cases and prepared homeopathic remedies with instructions how to take it. While making trip to Colombo we were learning about the lifestyle of the local population . Dr.Luc said it similar to Kenya; he knows better, I did not know about Kenya. It reminds me more of Mexico, the average poor level contrasting with some rich areas. Joe De Livera organized a homeopathic meeting later in the afternoon at his Villa. It was 4 local men, practicing homeopathy here and one Lady-homeopath, formerly from Germany. She is a home/friends practitioner .The local homeopaths do not have a professional homeopathic education, they are all are self-educated, and this created a big problem, as they far behind the advances in Homeopathy we learned in the school and seminars. But one thing in common: they all desire to settle and organize the professional education here, in Sri Lanka, and needfulness to establish a Homeopathic medical system legally recognized by the Government and Medical society. Here was Dr.Luc, the world famous homeopath, who spoke non-stop about how and what to do. They were asking Dr.Luc help them to teach in the future school, making plans, curriculum . It was very useful informational exchange between the participants of the conference. We exchange our contacts and promised our help regarding the Health Freedom Act and other aspects. In the evening, we arrived at Continental Hotel, where we are now. In the morning, after breakfast, we were picked up by Johan, the youngest son of Joe De Livera, and headed south, toward the Hikkaduwa, where tsunami made a moderate destruction. The wave was about 8 to 12 feet high, and the most destruction came to one-story houses, or the first floor of 2 or more story buildings. On the way, in Peralya, we met the local guy Siri, who lost his daughter at tsunami . He knows pretty well the area and agrees (for the money) to be our guide, driver and translator. Also tomorrow coming another helper from Germany , Sumudu Fernando, son of former Sri Lanka residents, who will be as a translator with us. He should bring my luggage, which Emirates airline misplaced on March 4 and delivered today to Colombo to Joe De Livera. It is a good news. I hope my camera will be intact and I will have my clothing and personal hygiene things. We arrived at Hikkaduwa at about 1 pm, having one stop, where the previous homeopath, Rene from NY was working. We met local people, who rebuilding theirs homes in a hurry , since the rainy season, called "Inter Monsoon" according to meteorologists should start in the third week of this month and continue until end of April. Thereafter, South West Monsoon will come in end of May and continue through June. Thousands of Tsunami victims are still living in tents and canvass hats, donated by various donor agencies and government authorities. So far, when we talked to victims and various local residents, nobody saw any money to help victims to rebuild their houses. However, the press full of promises, the European Union allocates $350 millions to help victims. So far, we saw a lot of ruins and debris along the Galle road from Colombo to Hikkaduwa. We saw a few teams helping with construction. It was all volunteers, from Australia, England, USA, Ireland, New Zealand and other countries. Dr.Luc and I, went around the area today , to see the extent of damages. Many hotels and restaurants was damaged or destroyed . The only survived structures were the thick poured concrete or reinforced concrete. Many stores already operating, especially on the opposite from the ocean side of the road . The wave was weakened by the structures located on the ocean side. Another hotel we went to see a little north from the Reef hotel. The security man told us he was a witness of the wave corning through the hotel, smashing wooden doors, windows, and partitions on the way. 2 men were killed instantly . Tomorrow we are going to see victims in the camps and villages . The local man Siri coming with his mini van and will show us all the places where we will be working with tsunami victims . The arranged van picked us at 9:00 and we went to the village Koscoda, residents of which have suffered from the life's abuse and Tsunami damages. We picked up the interpreter, the school English teacher Shirani. She eagerly agreed to go with us, since her teacher's salary barely covered for food of 2 people. She was surviving, because she lives with parents until they get married, which is habitually for this country. The villagers came to greet us, especially children. Everyone wanted a handshake and said "ayu bowen", which in local language meant "how are you". We came to one of the tsunami-destroyed building, former hotel, which had partial walls and a concrete floor, and luckily, for us the desk was there. Children brought a few chairs and we established a field office there. The remedy kits, paper cups, water and the computer was everything what we needed to start seeing patients . Initially it was a few, but within half an hour the crowd was growing'and they were staying in line, watching how quickly Dr.Luc and I were going through acute and a chronic cases. We were giving them remedies in water, asking them to bring the bottles with water, and believe me, there was no problem for both sides. In 3 hours, we finished all villagers who wanted medical help. Our next visit there will be in 2 days, Wednesday. Everyone received the remedy and prescription sticker with instruction how to take it. Villagers did not know about our visit. I suspect the next time will be the crowd twice more, plus repeated patients. Eating our brown bag lunch in the van on the way to next place, we picked up another interpreter Sumudu Fernando. He knows a local Sinhalese dialect. The morning lady- interpreter had to leave us for the day. Now we are heading south to Galle, where the tsunami destruction was more severe. We came to the Orphanage in Galle, where are 53 small children ages 6 mo to 3 yo. The manager lady came to greet us, introduced us to the medical staff. People from around the world volunteered to help there. We met an Australian guy, who was painting the fence, a Polish guy, who was playing with the children, an assistant manager, and girl from Arizona, coordinator of volunteers work, a couple from Czech Republic, 2 psychologists, and many more . We scheduled our first visit here coming Thursday. However, the German MD expressed clearly, he wants to keep treatment in his hands. Apparently, not everyone is very friendly with us. The day was over, back to the Reef hotel organizing the days work so we can use it for future repeated visits. And type this report. Time is 11:30 pm. Good morning, It is about 4:30 am, I cannot sleep, mosquitoes in the room eating me alive. I put a lotion, and now cannot sleep because of the smell of the lotion and thoughts of the previous day. We are using the internet service across the street to keep up with the world. I talked to the internet manager yesterday, his uncle was killed in the train, when tsunami hit. In that train, near Perilaya, about 1200 people were killed instantly. I asked about his aunt, she is in a bad shape. I said, tell her I can help, bring her to the hotel after work, I will talk to her and give her remedy . The majority of Sri Lankas I have met have very bad teeth . They are sticking out so much, like coming out from gums. I am practicing the homeopathic dentistry, and promised to help that internet business manager. Leaving hotel as usual at 9:00, picking up the interpreter lady school teacher and going to the village Wenamulla, where the previous homeopath Rerie from New York was treated villagers in need. We set the office in a half-destroyed house, but still having a roof. It is important, because for the last 3 days 2 were heavy rainy days. People start coming and we start our work with them. At about 2 pm the flow diminished, some people arriving from the nearest town Perilaya, we treated all who came and call our taxi for pick up and to drop the interpreter home and drive us to the hotel. Tomorrow we going back to the village Koscoda, where we were on Monday. So far, we see, that people are gladly coming to us and telling to us the stories about their previous allopathic medical treatments, which did not hold any good condition, but bringing only harm because of their suppressive nature. I am reviewing some cases of people we will be seeing today . Since we do not have too much time for a cases, due to the patients flow, mostly I am using Boger-Boenninghousen method built up into my computer's Homeopathic program Radar. I am also sometimes using Synthesis and a few books, like "The Peoples Repertory", muscle-skeletal diseases by Dr.Luc De Schepper, and Materia Medica by Dr.Pathak. We came today to village Koscoda for follow up and to see new patients. Most of the Patients we treated on Monday improved . We evaluate and made some adjustments . New Patients received an initial treatment. By return to hotel, we found a new homeopath, Dr. Ivy Dieltiens from the South Africa, Johannesburg . She came also with Homeopaths Without Borders organization. Tomorrow we are going back to the Orphanage in Galle. They kept infants in the baby cribs, mostly sleeping or crying. There are some volunteers, that coming as baby sitters, playing with kids, holding them, walking outside the building . However, there are not too many volunteers, and most of children left in their cribs to themselves. We informed the management staff, that we came to treat homeopathically the children and staff, in need. Within 30-40 min, nobody came to the designated area. Dr.Luc and Ivy went to find out why nobody was coming. Apparently, they do not bother to bring children . They are used to the doctor coming to the patients, like in the hospitals. We came to the area of children, went through the all beds with kids, analyzed, determined remedies, went to buy water bottles, prepared remedies in water and gave to the Czech doctor volunteer, who agrees to give remedies to children according to our prescription . Actually we expected more cooperation and a full day of work, but it did not happen . We left early . We made follow up visit to Wenamulla Village, near Peraliya. First, we met Wiclci, the former interpreter for Rene. He was recovering after prostate surgery--still has pains, blood in urine and many other problems . We started with his case. Meanwhile, other residents came and was staying in line, watching our work. The place itself was very uncomfortable. Our learn , Dr.Luc, Ivy and interpreter Sumudu was sitting on the piece of plywood. It was one chair that I was using, as I was working with computer and recording medical history of patients . The main Galle road was a few yards away, it was very noisy and I barely hlard the interpreter. We did a good job, because many patients improved their condition since our last visit. I am still wandering why the local government cannot organize a few medical centers along the Galle Rd., where the simple tents can be installed with the folding tables, plastic chairs, water cistern and some medical supply, like bandages, gauzes, dressings, alcohol. We have with us homeopathic remedies supply, but not every homeopath have all range potencies. So, the local homeopathic board, we met on the first day, should organize all of that in cooperation with allopathic doctors. The interpreters and a couple of vans bringing doctors and far located patients would be very helpful. And that would not cost much. A huge sum of money was contributed by the world countries. Why not spend a very little to help the population receive better free medical care? On 3/12/05 we visited the Handicapped house. Actually it is mostly mentally ill residents, or local people call it "Sambodhi home" It is- not attended by MD doctors, and it is-ok. One local nurse doing whatever she can. These patients need a lot of real medical care beyond the bandages and cream applications. The local coordinator Terri showed us some patients with bedsores, diarrhea, stomach pain, hydrocelle (cyst of the testicles), we prescribed and gave them homeopathy. We also left the bottles with h/o medicine to follow. The local nurse , very nice woman and coordinator Terrence promise to continue with our instructions, until our next visit on Tuesday . The children and adult patients become much attached to us, hugging us and requiring affection. Dr.Luc brought many small presents to children, like small dolls, balls and stickers. We made a few photographs there. On the way back, we stopped at 2 tent camps, to see if our help is needed. The first one attended by allopathic doctors 3 times a week. There is no room for us. Another camp did not see a doctor for 2 weeks. We will come back on Tuesday work here. Unfortunately, there is no central coordination, where help should go. We are doing search on our own, where medical help needed. So far, we are successful; there is plenty of work, for those willing to work. Only it could be more efficient, if we know from the beginning where to go,and there is an interpreter and transportation arranged. We are going to take a break on Sunday. So far, the week was very productive . But even on Sunday, while visiting the relative of Sumudu, the interpreter, I took a case of the old man in the house. Monday 3/14/05, we were working in Koscoda village. A few repeated patients came. Most of the patients improved very much, Some of them did not come, we sent children for them, and they said they feel much better, and do not need to see us anymore. At least it is good news. We could not go anywhere else because of lack of transportation . For the last 3 days, we been working with same villages, Wenamulla, Koscoda, Seenigama and city of Galle, treating the same patients or new ones as needed. We have been establish_ing the new area of work for our homeopath Ivy, lady from Africa, since she will stay here as long as she have patients and we were planning to leave on 3/19/05. We stopped by some camps, we had not been to, and talked to the local people, to find out what kind of medical help they are receiving, and if none, that would be our place to work. On the last day, we had 2 visitors from Colombo, the local homeopaths . They came to learn how we are working . Unfortunately, it was not too much time for learning, but we have done our best for them. They missed all that time we were here working in Sri Lanka. It is a question, why they were not working in the area of tsunami victims, and we are from different countries of the world coming and helping to their countrymen. Today, after work we have to leave for Colombo, in order to be able to confirm our tickets in the Emirates office. They require us to do so in person . "I consider myself veryfortunate to have had the opportunity of studying the methods used by Dr Luc yesterday at my residence in the treatment ofpatients whom I have been treatingfree of charge as I always have donefor the last 25 years." _arrive at Kennedy airport about 2 pm , Saturday, 3.19.05. It was a memorable time with Sri Lanka's people. Many of them praised the USA specialists. They know that the USA is helping them very much. The children at the last village of Koskoda did not wanted to leave us; they were running beside our car. All Sri Lankans were very nice and thankful to us. It was a difficult farewell, but Dr.Ivy will continue what we left, and that was a comforting thought for our hearts . We made a few hundred pictures of our patients and children and have many more friends. Good-bye Sri Lanka. HWB Thanks Dr. Strom for volunteering his time and sharing his diary. We also thank Dr. Luc, his observations and capacity for fund raising have helped this project immensely. Dr. Ivy Dieltiens in Sri Lanka is continuing the work with the support of HWB She is in need of a computer, and we are raising funds to help her. You can donate to HWB, POB 1550, Basalt, Colorado 81621. This project would not have materialized without the persistence of Dr. Rene Guarnaluse Arce, and Joe T. DeLivera in Colombo. Rene continues to work with HSF-Europe in helping to coordinate a long term assistance and teaching program. He was a member of the first team that included Dr. Eric Udell and Dr. Denis Marier. They left the beginning of February , and returned in March. Reports of their trip can be found at denismarier.com and scnm.com. Thanks to them for responding to the opportunity of helping the tsunami survivors. Many thanks to Washington Homeopathic Products and Natural Health Supply who provided homeopathic remedies . We thank the homeopathic community , and the NCH for their great support in responding to the tsunami disaster. Homeopathy is a medicine for the front lines. Emergency and crisis response should be supported and protocols for responding to such with homeopathy is now being addressed in the NCH and HAA organizations .